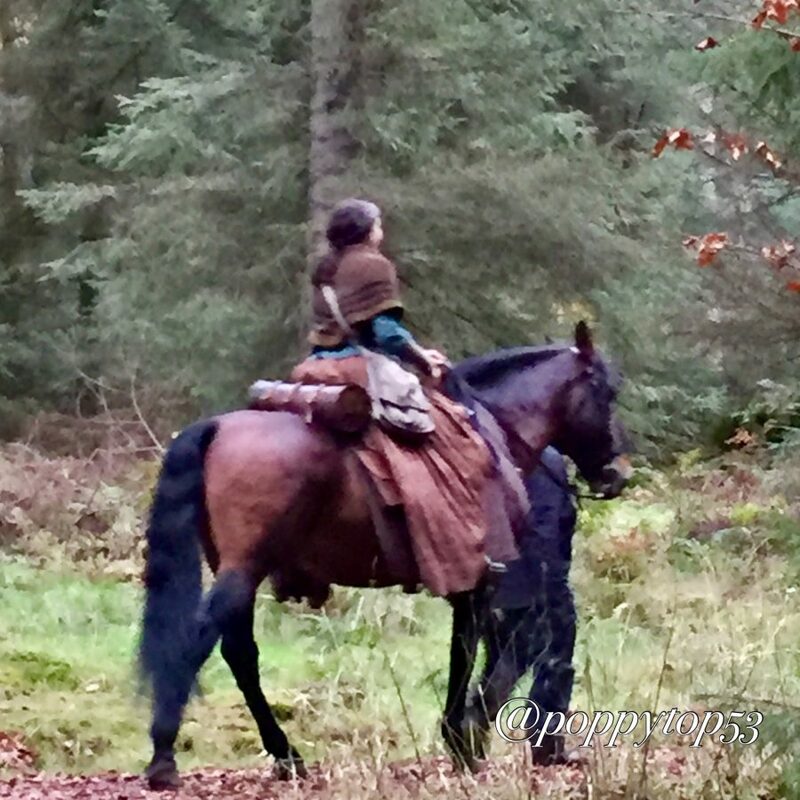 One adventurous fan takes a walk in the woods to bring us more behind-the-scenes shots and videos from Outlander Season 4 filming. When people criticise social media for ruining our ability to relate to each other, I say ‘No!’ Social media has given me a whole new and different set of relationships (like with you, the reader, ye’ ken?) For me it actually started in the early days of the internet. I made friends with an American woman through a common interest, and we kept up the friendship, even though it was more than 10 years before we met face to face. I’m about to go for my second visit with her and her delightful husband in Massachusetts this coming Christmas. but it was pretty chilly …. You may have heard of my Scottish gap year? Well, its quite hilarious to me that a lot of the info I get about what’s going on in Scotland comes from two Americans! 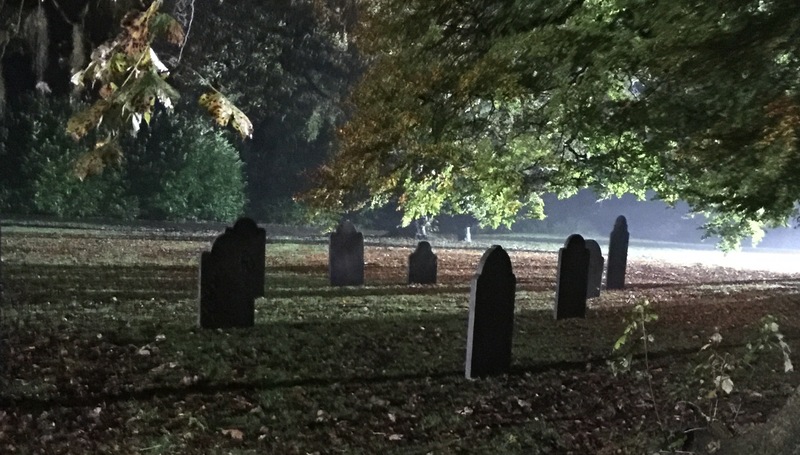 Anne Gavin, who you know as a senior writer and news editor for Outlander Cast, has Scottish friends and she relays all sorts of juicy tidbits to me that range from events going on at the end of my street, to the locations of Outlander filming. The other is Crafty Christine Lewis, an Outlander Cast Clan Gathering member (who you may know from Outlander Cast’s San Diego ComiCon Street Squad, and our adventures at the Blackpool Fan Convention), also has Scottish pals and keeps her finger firmly on the Outlander pulse around the globe. 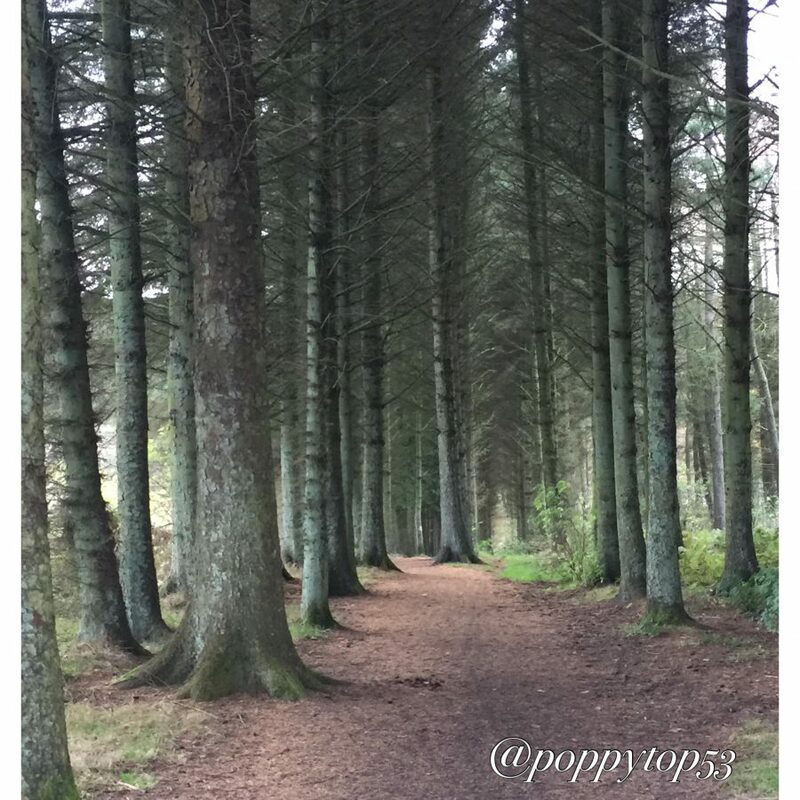 So, my social media channels were running very hot a few days ago with speculation about Outlander filming locations. Crafty’s friend lives close to where they filmed last week at Newhailes House, near Edinburgh. You may remember the adoring fan post by Cynthia Beaman Schultz that popped up in the Clan Gathering that day. I missed that event, but then, Anne’s friend, Ian, came through with the goods big time. 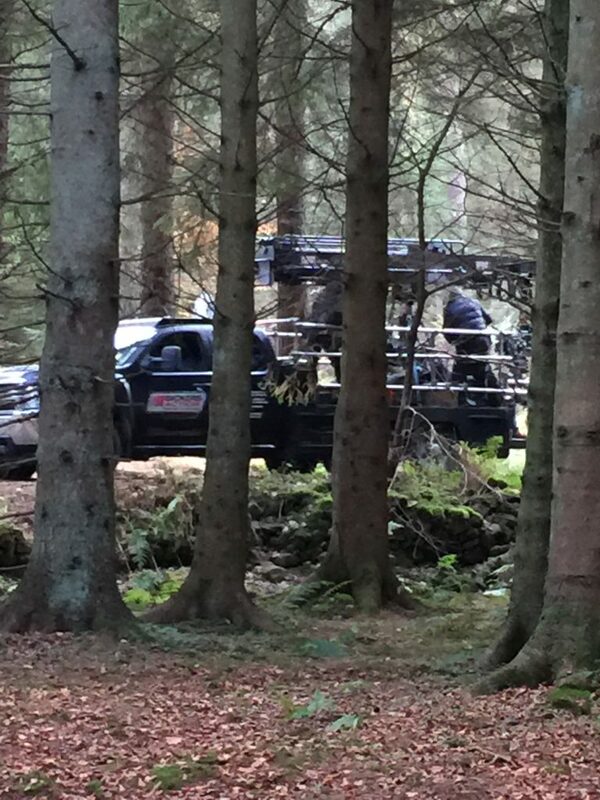 Ian was walking his dog in his local park and just happened across the Outlander team preparing the location for filming. Here’s the tantalizing pics he sent to Anne, she sent them to me and I got right on to it. She put us in touch, and Ian sent me everything from maps with coordinates to hand-drawn diagrams. I couldn’t miss it. Could this be Fraser’s Ridge, perhaps? My final instructions – I definitely wont get lost! The place to go was Beecraigs Country Park (what a cool name, eh?) just outside Linlithgow. 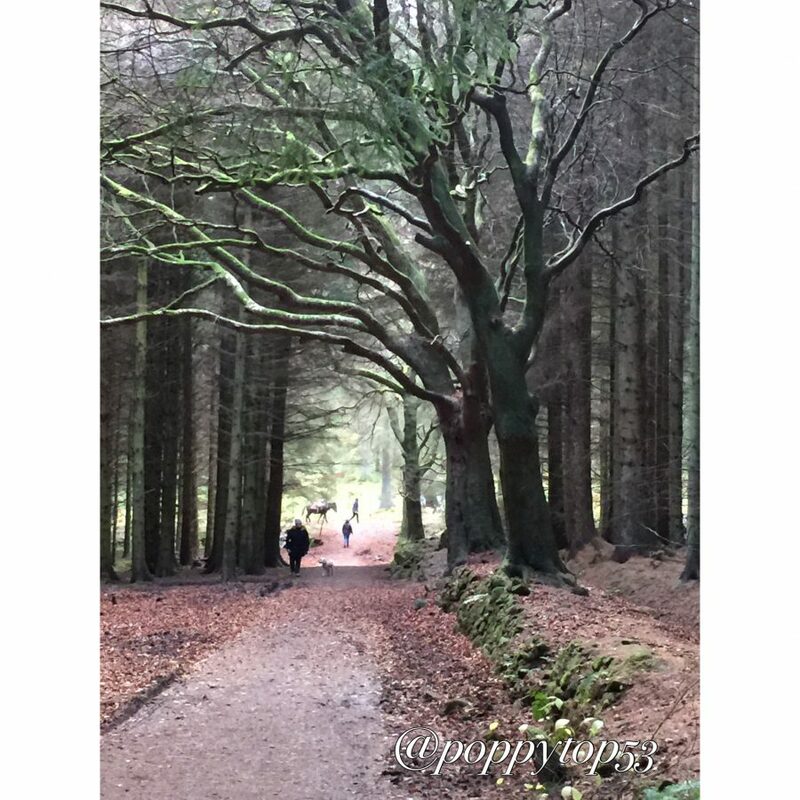 These country parks are everywhere in Scotland, they are huge public access areas with a mixture of environments—open fields, woodlands, gardens, usually a loch and a visitor center—and are home to a plethora of wildlife, including swans, deer, foxes, etc. Oh, and there’s usually a castle or a stately home, too. 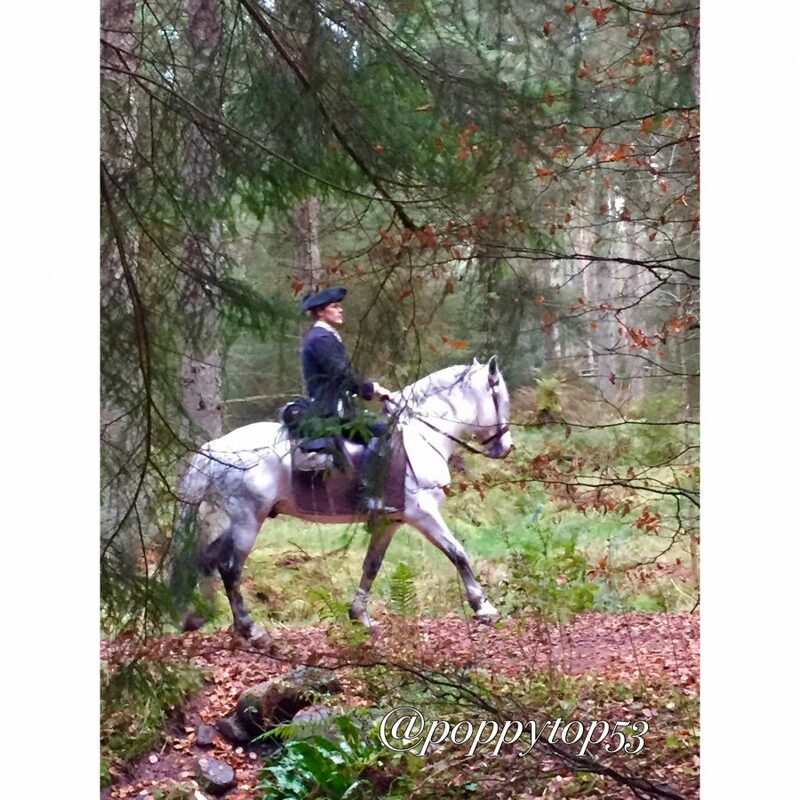 Outlander uses a lot of these parks for both the environments and the buildings—Pollok Park (the Jamie/BJR duel), Hopetoun House (home of the Duke of Sandringham) and Dean Castle (home of the Old Fox), to name a few. I spotted the Movie Maker vans a mile off, but my feeling of success was short-lived. I was told by crew that they were working on a public road and there was too much rigging, so it was a health and safety issue for me to be there. I was ‘escorted’ (a pleasant, chatty form of frog-marching) through the encampment and shuffled back out to the car park from whence I came. But during this escorted walk, I spotted Caitriona Balfe’s make-up artist, Anita Anderson, as well as a lovely furry character just sitting there with his handler, relaxed and waiting for his cue, I guess. Yes, you guessed it—Rollo! Rollo! Such a beautiful animal, relaxed and not looking the slightest bit fierce! Not daunted, I asked a crew member if there was any other place to watch, and she suggested I go to the other side of the park and make my approach that way. Well, I did that and came at first upon a security man who said I had just missed all the action and if only I had’ve been there five minutes ago! Gaaaah! I teased him that he was getting way too much pleasure out of telling me that. We had a few good laughs together. But with my ‘never say die’ attitude, instead of going back to my car, I decided to try a little cross country hike. There are paths everywhere in this park, and also people everywhere, local folks walking their dogs. So, I was able to ask a lot of people what they had seen and where the action might be. I finally came upon a road where off in the distance I saw people and horses—a eureka moment. Closer and closer… and there was the same woman who had given me the suggestion to try the other way. I’m gonna call her ‘Beanie Gal’ and you’ll see why from the pictures. She agreed that I could stay and watch as long as I would hide with her and the ‘Leaf Guy’ and not take any pictures while the filming was going on. It was the Leaf Guy’s job to run up between takes and spread more autumn leaves on the path. Can I have his job? Beats sitting in an office all day! Beanie Gal said it was very important that I do nothing to attract attention or cause distraction to the actors or the horses, or the shot could be ruined. 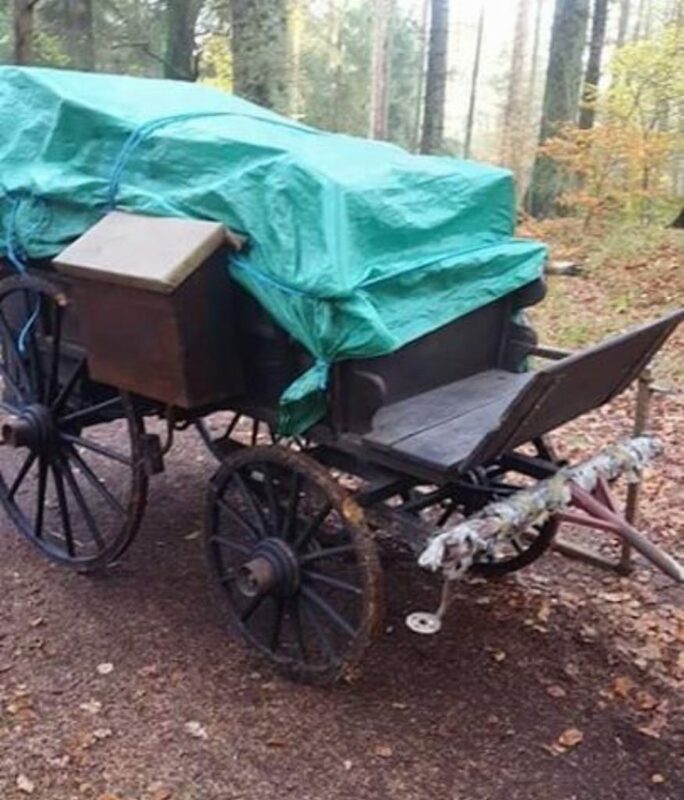 I soon saw that they were shooting a scene where Jamie and Claire are riding quietly down a road chatting away and leading a mule—it wasn’t actually a mule (would there be any mules in Scotland? ), but I think it might be their version of Clarence. 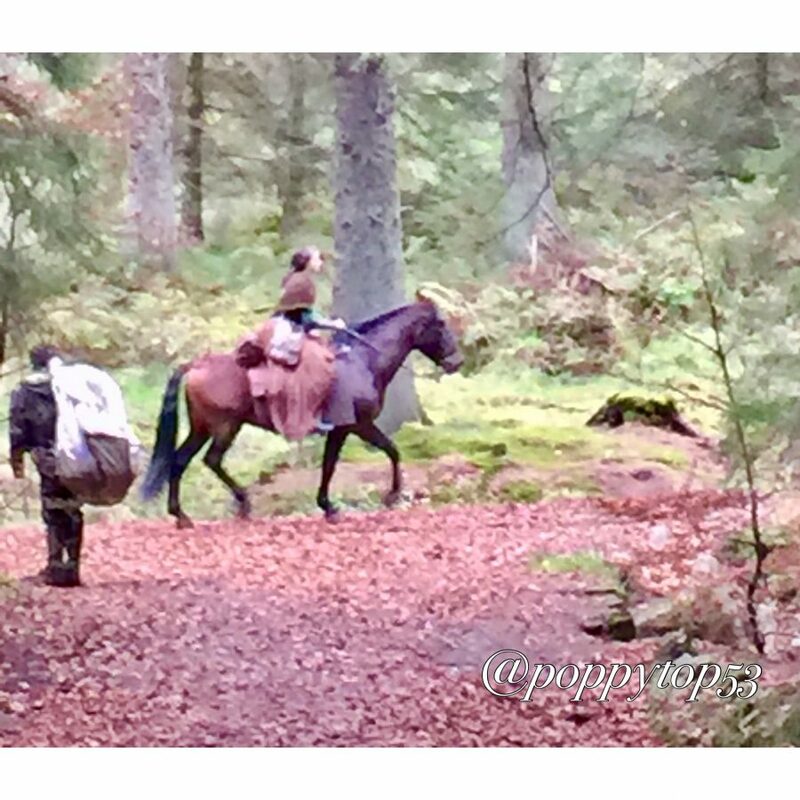 Here are some pictures I took—sorry, low light and forest-like conditions—and they are all of Sam Heughan and Caitriona Balfe returning to their starting point for the scene. This, of course, was played out over and over again. During the filming, we had to go way back into the forest and hide behind trees, (thanks Morag and Sandy for lending me the binoculars!) and when they were heading back we could come out into the open and I could take some pictures. 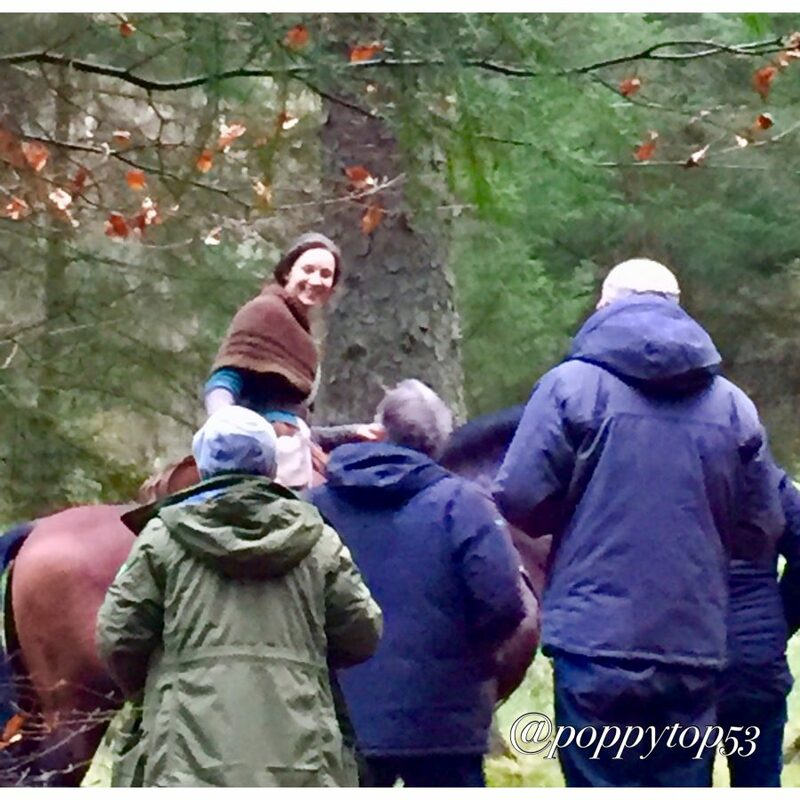 I was really impressed with Heughan and Balfe’s relaxed and confident horse riding. We, of course, see them riding a lot in the show, but to see them just riding along as natural as anything was really something. This little video I shot was them just taking off and trotting back to the start; they weren’t being filmed there, just totally relaxed and riding side by side. 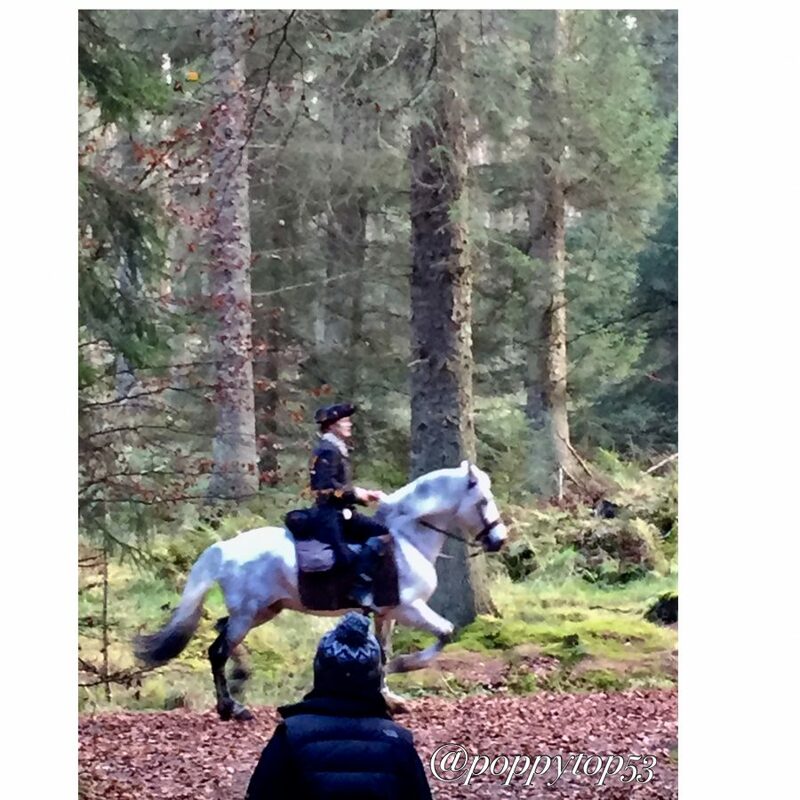 Heughan was riding a rather magnificent grey (Will it be Gideon? Gideon was a bay stallion in the books I think, but who cares about that?!) with a really high-stepping, prancing trot. Was Balfe riding the faithful Travis? Not sure. The bay she was riding looked smaller than Travis (the horse she rode in Season 1). 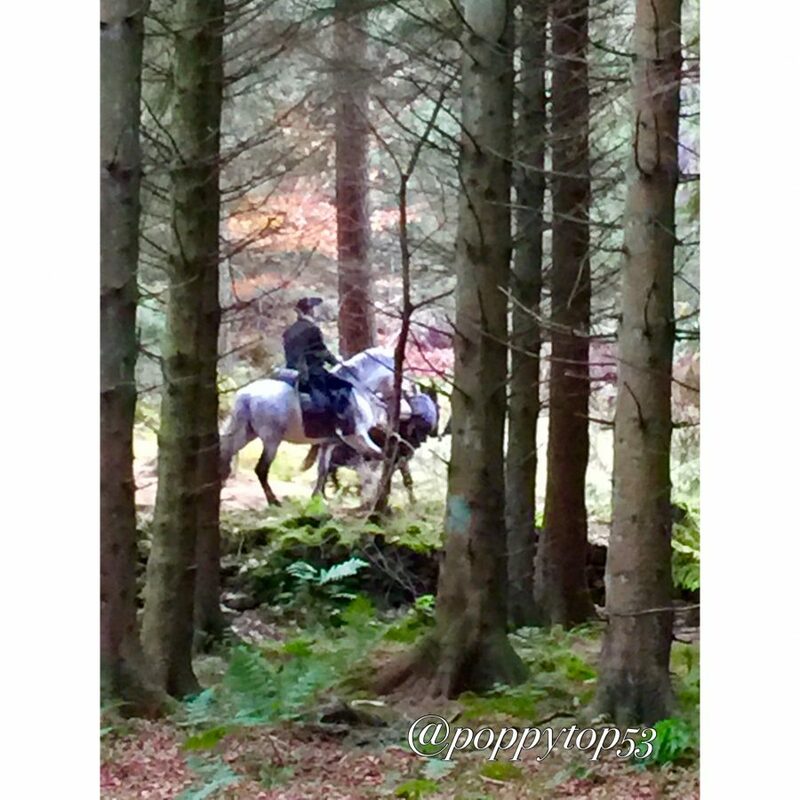 The action cranked up a notch when they were going for a long shot of Claire and Jamie meandering down the path on their horses. A lot more crew members came down, as well as the director, I guess, as he was telling everyone what to do and watching the action through a monitor. 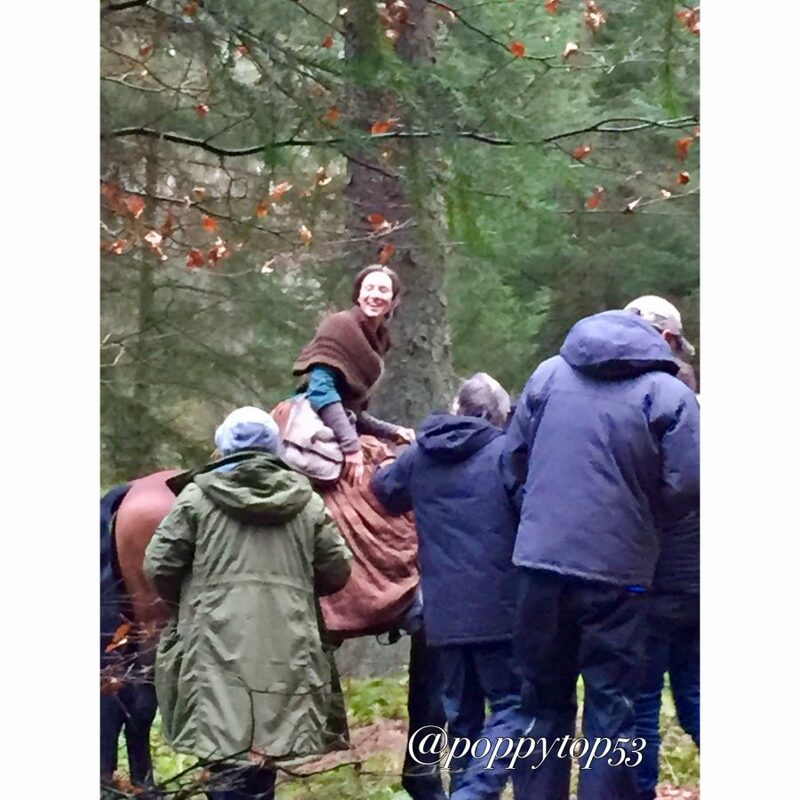 They only did a couple of takes of this and then lunch time was called, at which point Sam and Caitriona dismounted, thanked the crew warmly and hopped into their waiting cars. Everyone just started drifting away—Beanie Gal and Leaf Guy walked up the path, and that was my cue. 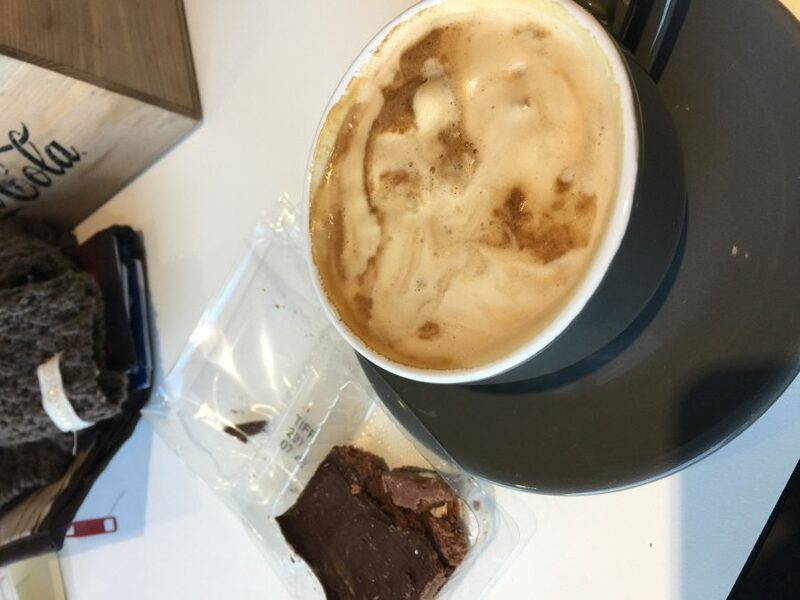 I was cold and slightly damp but quite pleased with my day’s activities, so I shifted myself back through the forest and on to the visitor centre for hot coffee and something chocolatey. Yum! Would you have approached them to meet them when they were done filming? 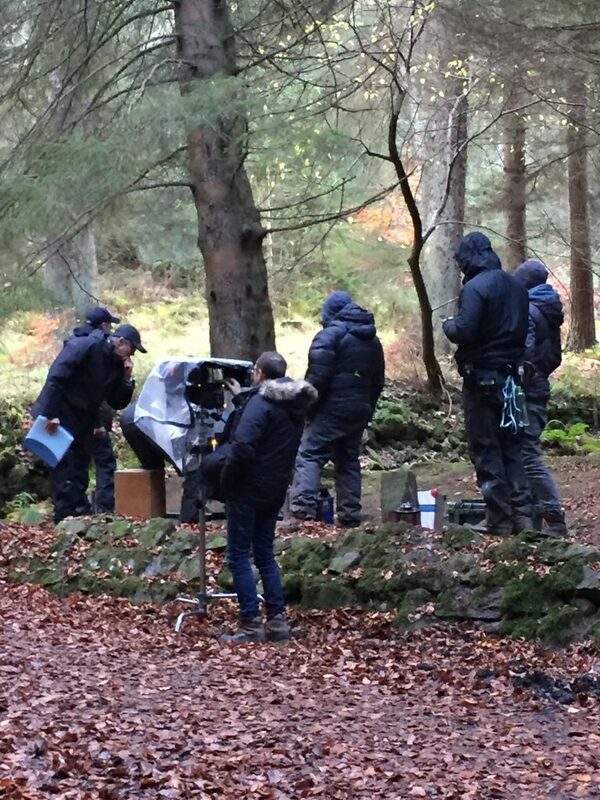 What’s your best guess at what scene from Drums of Autumn they were shooting? Outlander Season 2 Teaser is Finally HERE! Admire your dedication gal – can’t believe you were able to get so close to the set – did you swipe anything I promise not to tell ! Ha! No, I didn’t swipe anything, Angela! Makes me reflect on the folks who were walking around there out of Outlander interest, and the locals just passing by – no one would think to swipe anything – which is nice, eh? I guess our ‘good behaviour’ ensures that we can watch and look from a distance. Thank you a million times over for this! Leaf guy and Beanie gal…love it! Thank you for representing us as respectful, responsible fans! I so appreciate you! This is so cool! Thanks for posting! Thank you so much for this! And thank you for being respectful and not ruining possible future opportunities for this to happen again! Thanks Candace, everyone seems to be agreeing on the ‘low profile’ …. I hope it will continue that fans can get the opportunity to watch like I did. Glad you enjoyed the post. Please go back. Can’t wait to see more. Thank you. Thank you! Thanks for sharing this. We’re really envious. The photos are great, and it sounds like you had a lot of fun. Thanks so much for pics and video — Brave girl. I agree not to go up to them, could cause an uproar if they were found, put on more security, and maybe take them out of the scene. So good job!! Thanks Racquel, glad you agree with me. Don’t know about brave? Well, it was a little bit cold but nothing compared to what the actors and crew have to endure on some of those long, cold, rainy filming days and nights! Thanks for sharing your discreet capture of filming! Really great to see some glimpses of what season 4 will look like. Would I ask to approach them? As much as I would have liked to, I wouldn’t. To me it wouldn’t be respectful and would be inconsiderate of their limited down time. 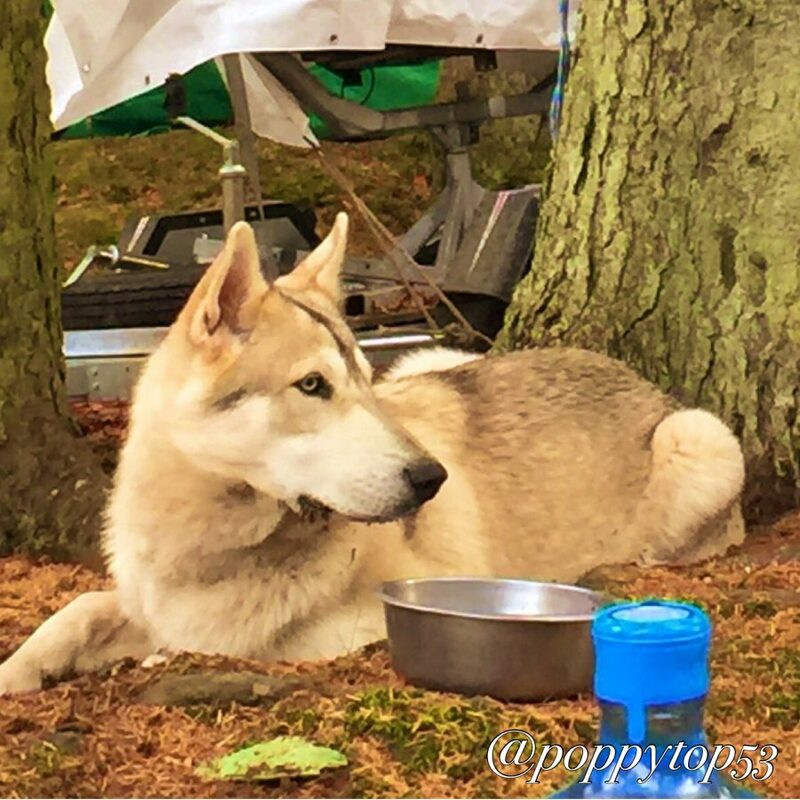 I hesitate to guess what scenes they may be filming…BTW, Rollo is a beautiful animal! Thanks Sidney, everyone agrees … that’s great! I’m not sure of the exact scenes either of course, because often they change the scenes for the show, eh? Hope I will see these scenes in the show, though! 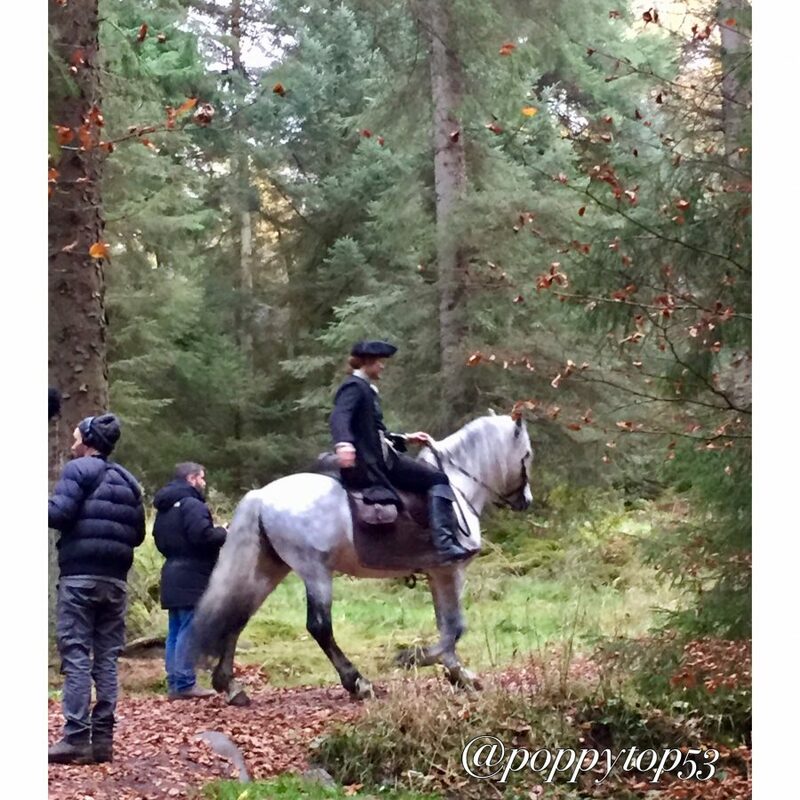 Yes, Rollo looked pretty wonderful, did you see the Outlander Cast post earlier by Janet Reynolds about the puppies? Check it out on our blog page, it was really interesting. 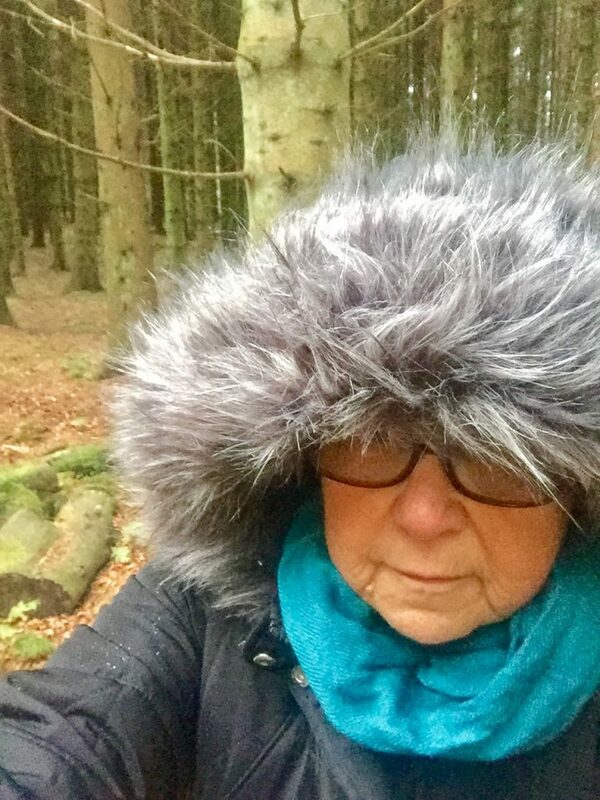 I AM LOCAL NEAR BEECRAIGS, IT HAVE BEEN RAINING CATS AND DOGS TODAY SO I WOULD BE VERY SURPRISED IF ANY FILMING WAS DONE TODAY. Hi Linda, yes I’m glad I got to go there on a pretty dry day, it only rained a little bit towards the end. You are lucky to live in such a beautiful part of the world, I will definitely go back another time to have more of a wander around that park. How interesting this was to learn about how it works behind the scenes. I too would not want to intrude or interrupt the crew or actors in any way. It would be rude and this is their JOB after all. Danke für die wundervollen Bilder und Beschreibungen. Wann hat man mal die Gelegenheit hinter den Kulissen zu schauen. Ich freue mich schon darauf, demnächst noch mal so was wunderschönes zu sehen. You are so brave!!! Thank you!!!! Magnificent investigative skills here. Love all the photos and agree about not approaching anyone for photos. This is their job and they were on set and working hard. Love beanie girl and leaf guy, what will your sleuth name be? It is wonderful to get a glimpse of everything, can’t wait for season 4 now, this has just made it harder to wait till next fall though. Thank you for this ? What an exciting adventure! I agree how you kept your distance and were respectful. Thank you for sharing your photos and experience with us fans. Great job. So much smarter to be respectful or security would clampdown. Why would one steal anything? An action like this would soon destroy the ‘friendship’ between fans and the ‘company’. Would only take some idiot to do something that caused an accident, a tragedy that finished the show. Maybe take the pics but don’t reveal how u got there…. Hi Sherenne, yes it’s important to do the right thing in these circumstances I think. It is true that some Outlander fans have caused trouble (like just leaving a big mess etc) at the sites of previous film shoots, but we need to be aware that the way we behave reflects on all the fans. 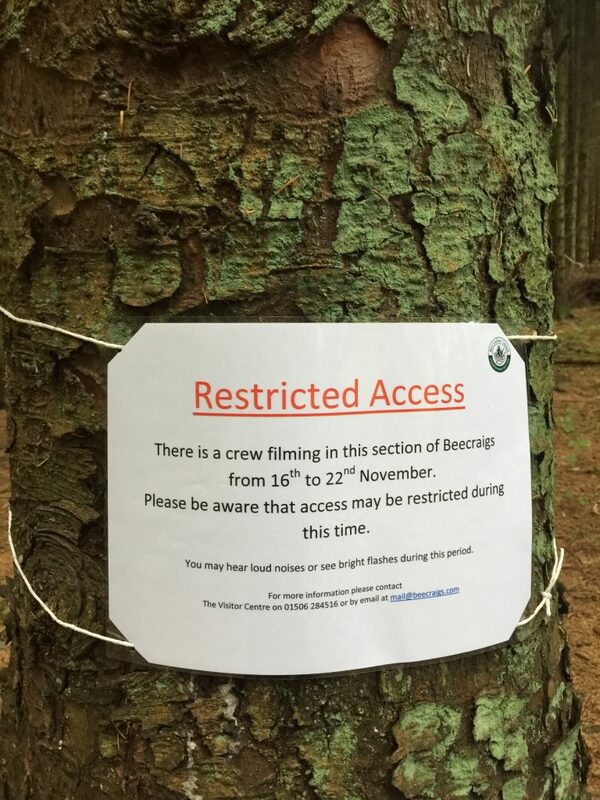 We at Outlander Cast were careful to make sure this post did not go live until the filming was finished … we would not put up a map showing people how to get there and possibly cause large scale security problems. 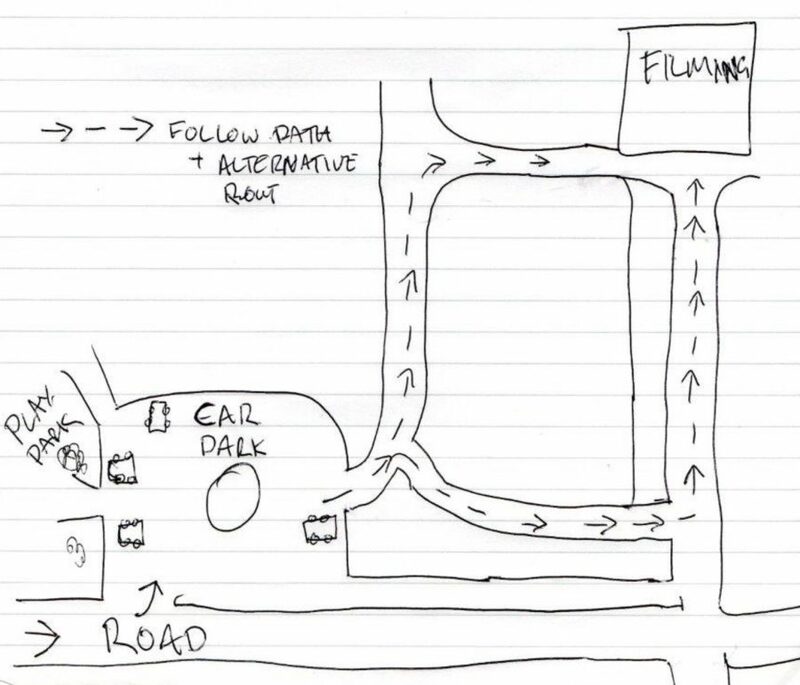 I put the map in just to show the process we went through with our plans to check out the filming (on a very small scale) …. hope that makes sense? I’m in New York State and thank you for this peek into the shoot. I’m guessing it is very chilly and monotonous, but you were the perfect ‘snoop’ and respected them all. Thank you! Thanks Linda … I’m officially a ‘snoop’ …. Ha! ….. a respectful snoop! I didn’t find it monotonous because it was such a beautiful place, and there was always something going on …. it was chilly but I was well rugged up. I do admire the crew and actors for working in gruelling conditions all day … and night …. and sometimes, for the actors anyway, in quite flimsy clothing!! Brrrrrr! I totally enjoyed your report & lovely photos, thanks! 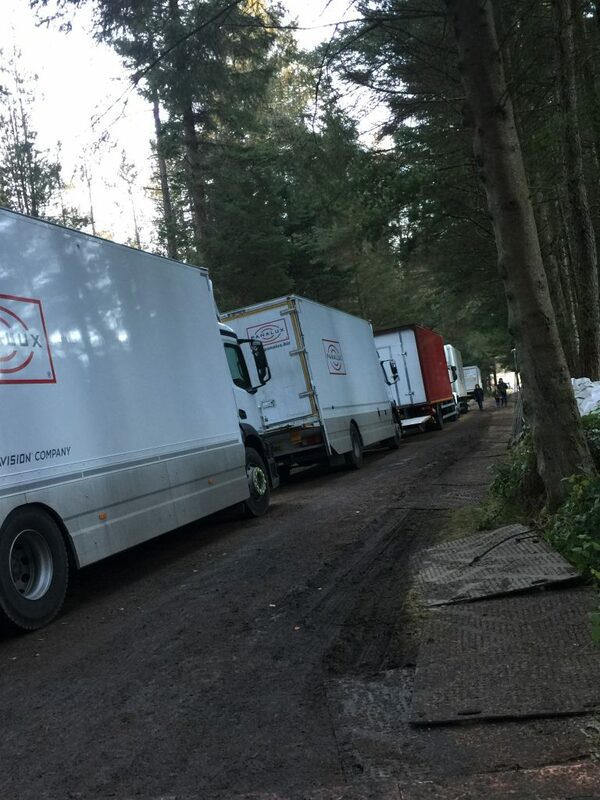 So many people work so hard to make Outlander. It’s fascinating to get a peek. And Scotland is so beautiful. Wow Andree, great detective work!! How long were you out there sleuthing around?? Those trees with the twisty branches do look scary, lol, glad you captured some photos along the way, quite the adventure! I do agree in not approaching them afterward, it would be a bit of an ambush, and I’m sure they must have been freezing too (not having the beanies and parkas that everyone else had). Spectacular day! ???. Thank you very much for this magical gift. It’s honorable your respect for actors & crew. Congrats for the great work!! How wonderfully generous of beanie girl and leaf guy but particularly to you – thank you for sharing your incredible experience! Thanks Gwen, glad you enjoyed the post … hope to bring you more one day. So great to see bts pics! I agree with not asking for photos with Sam and Catriona, they are working and after a day of work they are probably tired and looking forward to going about their lives. They must get tired of always being interrupted and asked to pose for pictures, yet they always appear friendly and gracious towards their fans! Glad you enjoyed the pics JMS. And looks like we’re on the same page about boundaries with the actors. Sam and Cait are always so friendly, but yes, they must tire of it sometimes. This was a wonderful read. I have always been fasinated with how filming and sets and all that behind the scenes stuff comes together more than what the finished product is even though I love the show. Always made me wonder how they put it all together. Now I understandjust alittle more about what film crews do. Thank you for this wonderful BTS look. What an amazing adventure! Thank you so much for this view into the process and I think you did exactly the right thing by giving the cast and crew their space! Lovely shots..I did to enlarge them to see better, but couldn’t. 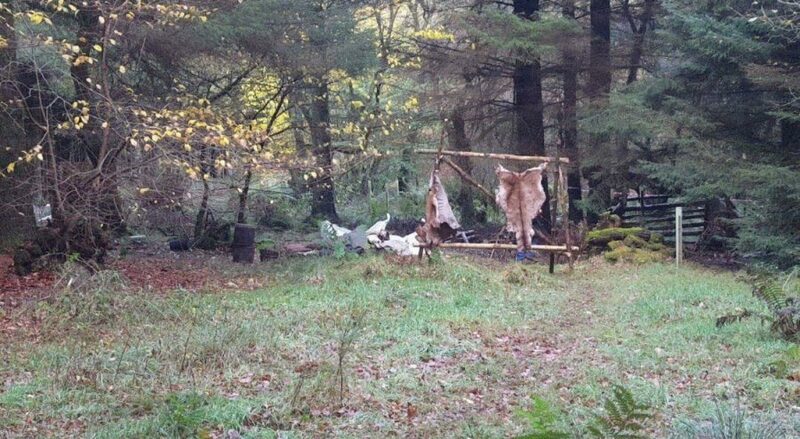 I’m thinking these scenes are traveling up to Fraser’s Ridge to claim their property. Along the way is when the bear is killed. I would not have bothered them either. WOW!! This is magnificent! Thank you, thank you for doing this for us. I’m in awe that you are able to live so close that you can take advantage of stepping onto the set and being a part of the excitement. Your dialog along with the pictures make me feel like I was there as well! I appreciate the respect you showed by not asking for pictures with the actors. If you have the opportunity to do this again sure hope you will be able to share. This is coming from Missouri, USA! Thanks Martine, glad you agreed with my non-intrusiveness. It was all very exciting, Rollo, the horses, seeing them riding …. all of it. Thanks for your appreciation. That was so wonderful to see, thank you for sharing. I def wouldn’t approach as it’s all exciting to us fans but at the end of the day it can be an exhausting long process for actors, and being approached whilst filming can become tiring. Thanks for representing outlander fans so well & giving us a good reputation. Thank you for the behind the scene pictures & vid. And thank you for being respectful and not bothering anyone associated with filming. 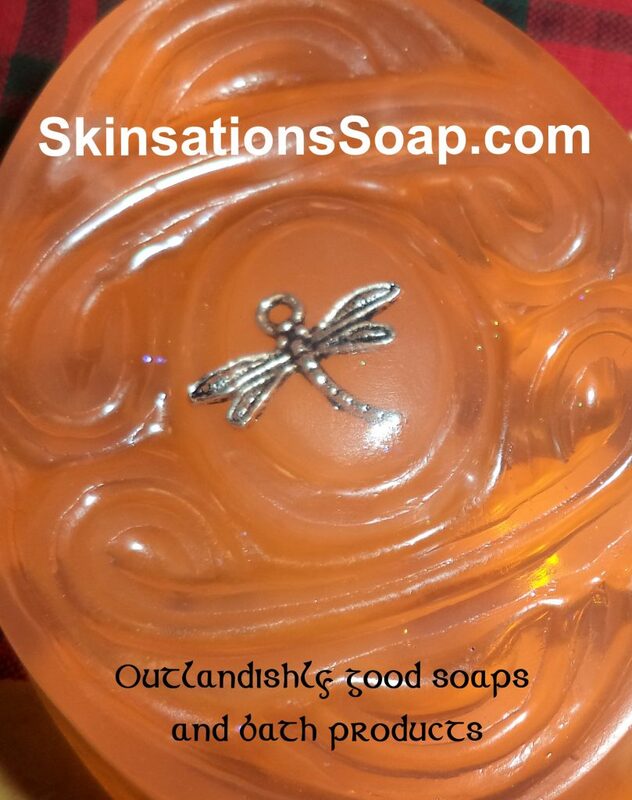 It gives Outlanders fans a good rep! Though, I would think it would be so tempting to get close to Cait or Sam. Carry on your behind the scenes work. I can’t wait to see season 4 & say to myself ‘Hey, I saw pictures of that scene when they were actually filming it’! 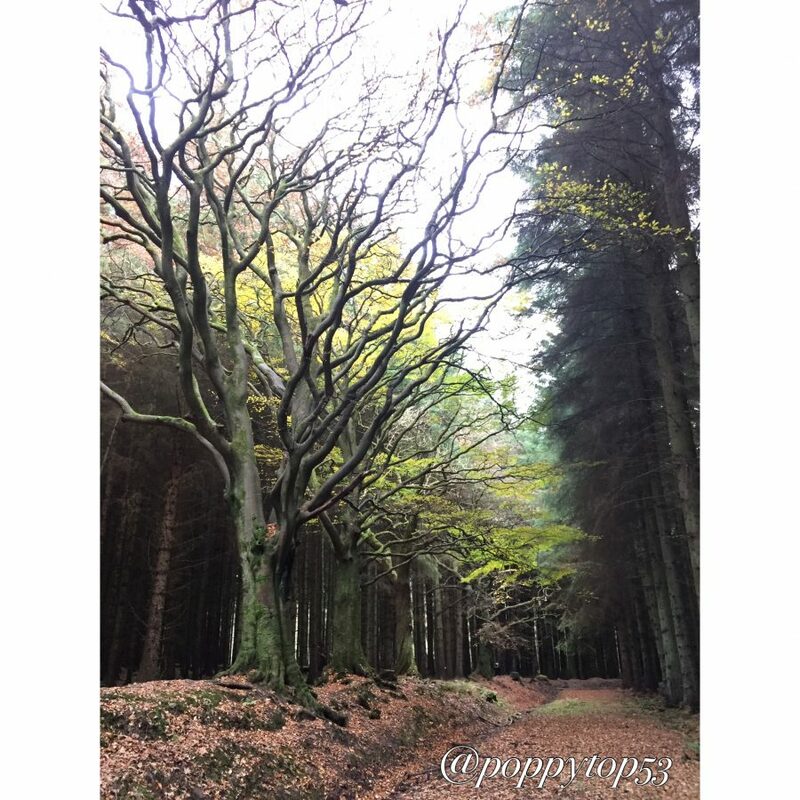 Hi Corina, glad you enjoyed the post and think I’m helping to give us a good rep 😉 …. I’m looking forward to seeing these scenes on the show too …. fingers crossed. Thank You so verra much! 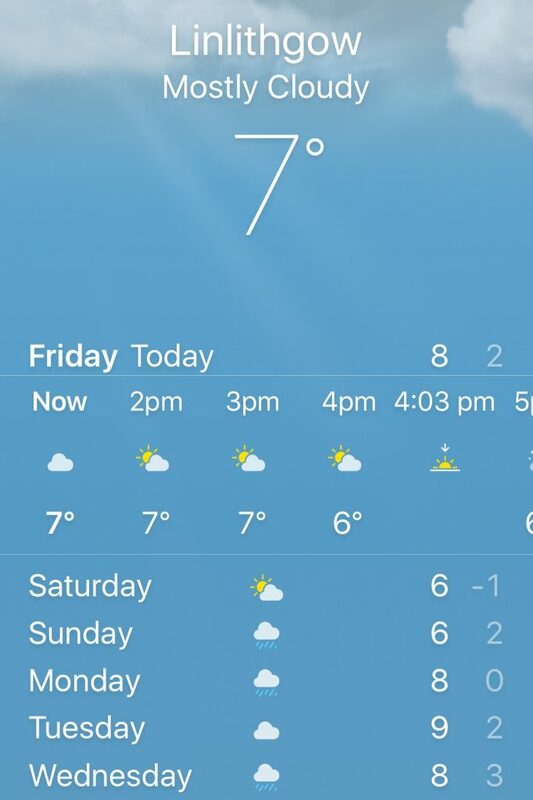 Thank you for getting very cold for us! Lovely pictures. I’m a horse rider so always enjoy the horses. Sam’s horse has a lovely gait. Sam looks good, too.? The setting is very atmospheric. DOA is my favorite book and I am really looking forward to watching it. There are so many relationships that are developed. My favorite part is LJG and Willie showing up. When I met David Berry last month, I had him sign the pages where he is sick and he mentions how transparent her face is. Her reply that she was just born that way and his reply saying that he was too, is so meaningful. It is amazing the number of people who have made meaningful relationships around Outlander. The Outlander Fanatics of!Washingto are a great and active bunch. We just had a craft day making blanket shawls, insects in Amber, candles, Japanese braiding, as well as other classes. I am very thankful to our group for sharing my lov of the books and providing some activities to help me get through a difficult year. Hey Frances, the ‘Outlander Fanatics of Washington’ sounds like a great group to be part of! 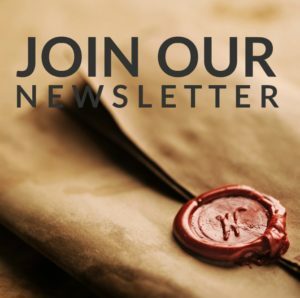 I agree with you about all the great connections we make with people around Outlander, and also about DOA …. its my favourite book too ….. I love the whole measles and falling into to privvy thing! but I also really love the part where father and daughter meet for the first time. Can’t wait for all of that. Did you meet David Berry in Canada? Lucky you. Love his portrayal of LJG. As 2017 draws to a close I hope that 2018 will be a better one for you. Thanks for all of your hard work. Truly enjoyed seeing these pics. Does Claire finally have gray hair? Thank you so much for the information and awesome pictures!! I wish I could be there to see for myself. Keep us posted. Hi Jennifer, sorry I didn’t reply straight away. Glad you enjoyed the post … and yes, I’m going to keep you posted as much as I can. My new post about recent filming near Glasgow was out up yesterday, and I think there’s more to come. This is coming late to you, but I thought you’d like knowing fans continue to see your wonderful report. For me, I’m really glad that so many posting here would not approach Sam/Cait because it indicates we’re not all into the ‘fangirling’ thing. 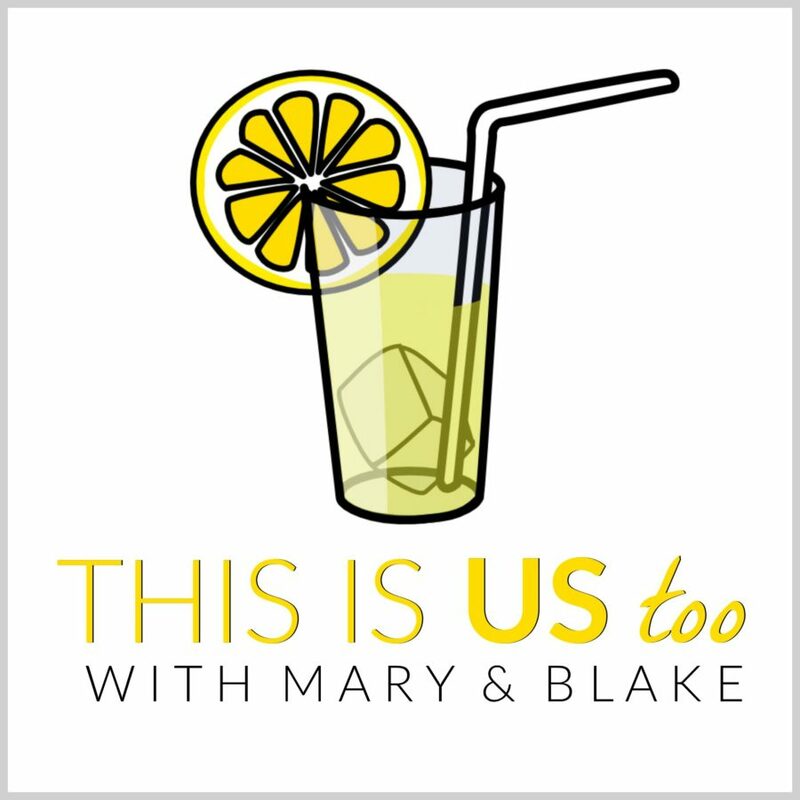 I read an interesting celebrity analysis piece – academic- that states that there is a one-sided relationship that is a hard adjustment for celebrities. We the fans think we know the stars but the stars DO NOT KNOW US. We are strangers to them and it can be quite disconcerting for them to be approached over and over again. Exhausting. They have 16 hour days, and are cold, and then must act very polite and kind (our stars they seem to have naturally pleasant personalities). I’m glad you left them alone to stay focused on their job. 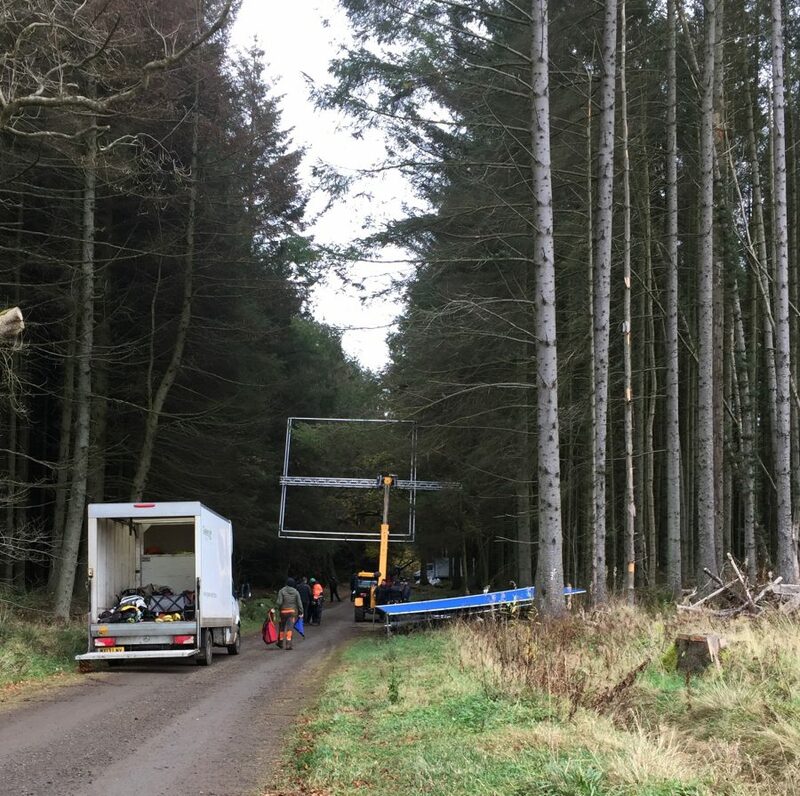 It’s harder work than I imagined for actors generally, and Outlander is especially difficult given its many outdoor locations in glorious (but damp) Scotland. Thanks for being there — please do it again. You have excellent sleuthing and writing skills. And the photos were to die for! Thanks for your thoughtful comments Dawn. That was an interesting article you read. This is the first time in my life I have been a ‘fan’ so it is all a new experience for me … and there are widely varying viewpoints about interacting with famous people. Some feel it just goes with the territory and thats what they get paid the big bucks for, others back off and give them space. I imagine it is exhausting to have to be friendly and nice to people when you’ve had a long, hard, cold day … but Sam and Caitriona do seem to be naturally very good-natured people. I have just put up a new post about some filming over the last week or so, and there is more to come I think, so stay tuned. Thanks again. Thank you for braving the cold for this. Thank you so much. That was most enjoyable. Please keep us updated. I would give anything to visit Scotland and visit the scene.